Fresh off the boat this morning after a 'blind' buy on eBay, this is the new (F-reg) camper van. It's a Ford Transit, and thus has a fine rock'n'roll heritage. I finally got round to telling Susan about it this morning...she hasn't seen it yet. What can I say? It's got a satellite TV and GPS. And a toilet. What more could you ask for? Well, it sleeps four but only seats two, which is a bit confusing. Is Nick Lowe's Jesus of Cool the great post-punk, post-modern pop masterpiece? Just bought the re-released, special 30th anniversary edition of the album today at Clive's. And it is truly a fantastic array of deliberately derivative, scabrously witty pop perfection, full of comments on the music industry and munching-of-the-hand-that-feeds. It makes the Arctic Monkeys sound like slavish lackeys of The Man, but then this came out of the Jake Riviera/Costello/Dave Edmunds/Dury stable, where Lowe's sleevenote avowal that he was 'more interested in making mischief' rang universally true. There's almost a second album of b-sides and outtakes including the sneering I Love My Label and the brilliant They Called It Rock (Dave Edmunds' title for Shake and Pop, and MUCH better in the Rockpile version. One warning for the easily offended religious in your life: the new version comes in a mind-blowingly blasphemous sleeve that folds out into a giant crucifix. I was going to say that these days, no-one would dare. But someone did. Roderick Aichinger is a young photographer from Germany, who came to Shetland two years ago, after seeing the book Tom Kidd and I did, Black Gold Tide. 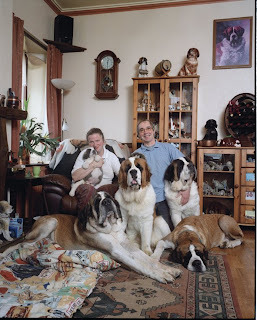 I think this picture of Chris and Penny, St Bernard breeders of Yell, from whom we got the lovely Lulu, is absolutely brilliant. 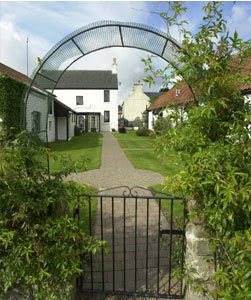 2003, and the show was coming from Inverness, prior to a live roadshow in Portmahomack. Special guest was Edwyn Collins, who was both playing live - solo - at the roadshow in the Port and on the radio at the Inverness studio. I'd known Edwyn since the mid-eighties, and my wife Susan was at university with his wife (and manager) Grace. But he was always surprising, whether it was being able to quote entire reviews back at you, as he did when the late Graeme Kelling first introduced us, in the old Night Moves club in Glasgow, or, as in Inverness, producing from a secret stash a tin of Tennent's Lager and comsuming it out of Grace's view,with the words, "I've never played without a beer and I don't intend to start now. Don't let Grace see." That summer night at Portmahomack, the highlight of the village's gala week, was a riot. Grace and Edwyn brought a horde of relatives (they have a house just up the coast), the hotel function suite was jumping with kids, much beer was openly drunk, and he played brilliantly. Two years later, Edwyn suffered the first of two devastating strokes, and later contracted MRSA in hospital. For a time it looked like he wouldn't survive. Certainly, most thought he would be left severely disabled and would never play again. Yet on today's show, he performed, absolutely live, two songs - including the legendary A Girl Like You, sounding wonderful. And we talked a little about what had happened to him. You can hear the programme on BBC iPlayer for seven days from today. He's not the ebullient, wise-cracking repository of lacerating wit and devastating put-downs he once was. But he's still Edwyn, alive and gloriously being himself. It was an absolute joy to speak to him and hear him sing. He's currently touring with a full band, including the two excellent fellows who played with him today on the radio - Andy Hackett and the legendary Roddy Frame. Celebrate with him if you can get to any of the gigs. 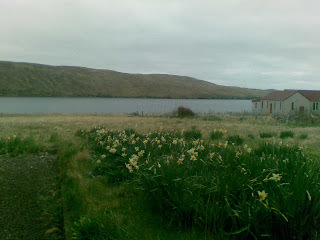 Daffodils are out at The Radiocroft, despite the temperature, which remains Baltic. In fact, the Baltic will be a hell of a lot warmer than it is here. Cycled along today and nearly got frostbite. Nevertheless, the colours are changing as spring kicks in, and I find to my utter and complete astonishment that my thoughts are turning to boats and camper vans, not necessarily in that order.The decision by the two in-house weans that the line-up for Hydro Connect is -just- cool enough to tempt them, and the fact that Susan should be able to go as well, means that I had a look at The Large Tent, last used, disastrously, at the Cambridge Folk Festival in 2002. And then I stopped looking at it, remembering the way its patented 'easy-pitch' system trapped fingers and caused much bemusement and shouting. 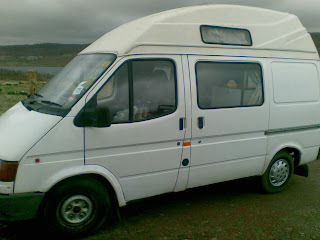 Could I return to the vicissitudes of camper van ownership, though? How many VW Type Twos did we have? I think it was two. Much of that experience is a blank, fortunately. And yet...who can forget the weekend in Applecross with three kids in the pop-top? Then there was the T25...the endless replacement of spark plug cables, the tin-of-WD40-a-day habit. Not to mention the Fiat, in which I slept through an Inverness winter in the car park of the BBC, and the horrendous Talbot, incapable of more than 25 mph in a tailwind. With moss on the inside of the windows. 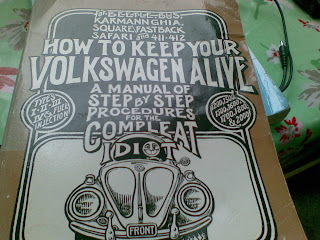 Weirdly, I have just discovered, in The Bookcroft, a copy of the hippy manual on Beetle and Bus maintenance, John Muir's How to Keep Your Volkswagen Alive - A Manual of Step-by-Step Procedures for the Compleat Idiot. I think it may be a sign. A wee present...two lobsters, to be precise, expertly turned into thermidor by Susan and the very berries with tatties and salad from the polytunnel. Yum. Meanwhile, the Mighty Torslanda passed its MOT with no advisories or faults. Just taxed the big silver beast for another year and thundered into and out of Lerwick with no problems. £390. Some day all cars will be this cheap. The death of Danny Federici, keyboard player with the E Street Band, was announced last night. More details on the official Springsteen website. Malignant melanoma, which is rather too close to home for comfort. Not that any of them are likely to read this blog, but my thoughts are with his family and associates. Only in Edinburgh: being woken at 2.00 am by the sound of someone playing tuned bongo drums outside the window. Well, it was Marchmont I suppose. The stem cell research event went well, I think. But it was only afterwards, in the marbled and oaken grandeur of the Scotsman Hotel, that the real science fiction stuff emerged from three of the five professors involved. My eyes were popping. So was my brain. I feel a million-selling medico-cyber thriller coming on. Anyway. Sitting in the foyer bar at The Scotsman was an odd experience, because this used to be the main entrance to said newspaper, and it was here I waited, nervously, to be called up to Magnus Linklater's office, where I was to be interviewed for the job of Highland Reporter. Magnus was smoking a cigar and feeling benevolent, I think, after judging a school newspaper competition, because he gave me the job. I paid many visits to that venerable building (they'd given up printing the paper there, but all the editorial and advertising departments for The Scotsman, Scotland on Sunday and the Evening News were still at North Bridge). Apart from the gentleman's club atmosphere of the editor's office, the availability of the Jinglin' Geordie and Halfway House bars and that jaw-dropping public entrance, by the early 90s it was, internally, a grimy tip. But it was positioned at, and to be the heart and soul of Edinburgh, and indeed of the country. The smell of printer's ink never really disappeared when the presses went. There was a romance and a sense of tradition to working there. Now it's a posh hotel, the paper's HQ is housed in a glass prefab next to Dynamic Earth, and I am a light entertainer, not a newspaperman. And, of course, a chairman of panel discussions on stem cell sourcing. Found myself having dinnner last night at The Grain Store in Edinburgh's Victoria Street - very good, but it wasn't until we adjourned to the Bow Bar opposite that we realised what all the paparazzi kerfuffle in the street had been about. Seems Kate Moss had been in town with her boyfriend, who is the guitarist with boyish beat combo The Kills. Not only that, but she had actually been in the Bow Bar, drinking Guinness and Morgan's Rum, according to the Daily Record. I saw lots of blonde Edinburghian Mossalikes, but not the genuine article. I was in Embra for a meeting to discuss tonight's public meeting on the subject of stem cell research, which, for my multifarious sins, I am chairing part of. My job seems to be keeping five professors in order and steering them away from jargon. Shouting at professors is always fun. Why am I doing this? Oh, a friend of a friend asked me, and I couldn't really say no. Apparently I don't have to know anything about stem cell research, which is just as well. I caught the 11.30 train back to Glasgow, and bumped into Orcadian author-turned-vintner-and-dramatist Duncan MacLean. Don't think I'm allowed to say what he's working on, and was in Lower Scotland to discuss, but it's to do with Shetland, very major and very exciting, I think. Anyway, last day in Glasgow for some time...through to Edinburgh tonight, Aberdeen tomorrow and home in Shetland on Friday morning. I had the privilege on Sunday to be the first performer at The Stables, part of the Inn at Lathones in Fife (near St Andrews on the Kirkcaldy road). David Mundell, formerly of the Beinn Inn at Glenfarg, is now booking acts for the Inn and he has some great people coming. Have a look at the Mundell Music website. Many thanks to David, and Pete Alexander for making the Malt and Barley Revue gigs happen so successfully. It was nerve wracking at the Glenfarg Hotel on Saturday night, the first time many of these songs and poems had seen the light of an audience. Especially when wife and daughter were actually IN the audience. But both at Glenfarg and Lathones, the whole thing went down down really well. Thanks to everyone who came, especially those who stayed at the Glenfarg Hotel and had to leave without their breakfast! David's rock'n'roll memorabilia from the Beinn Inn is gradually being incorporated into the Inn at Lathones, where owner Nick is totally suppportive of the new musical direction. Themed suites (really beautiful) including a Henry McCullough suite and a John Jorgensen room are almost complete. There is talk of a festival. the food's great. I can't wait to return. "Tom. For goodness sake (as you would say). You cut a square of card. Cut a triangle of brown paper to cover half of the card from opposite corners and tape it to two edges. Fold the card across the other two corners and you have it. Flick your new device so the paper pops (or thunderbangs) out. 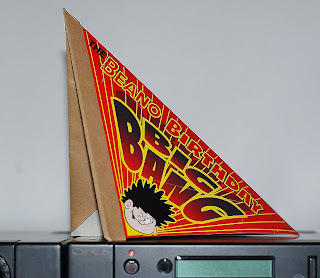 I think they were given away with Beano and maybe the Topper (was there a Topper?)." For the blog if needed, don't say I ain't good to you. Off 7" inch square card - were the earlier ones not a bit bigger - but maybe me being just that bit wee. Anyway, adding to what Sandy says, I'd say at least cornflake box sort of thickness decorated to taste, with stiff brown wrapping paper well secured across 2 edges. Then both folded diagonally. After a bit of on line research, my cracker seems to have been a free gift in July 1998 .... so definitely a new comer. God - 10 years under the record player, shows how much dusting I do." Renting a holiday flat in Glasgow for a week, sight unseen, over the internet, has proved mostly successful - it's comfortable, clean, plenty of room for Martha and Susan (James is, ahem, ski-ing in Italy with the school; beats a week at Abington Army Camp in my young day). But there's no broadband, and despite the proximity of PQ, with its endless digital power, I find the inability to blog, Facebook, check email and generally surf debilitating. Not helped by my having dropped the Nokia in a puddle on the Hillswick Ness, which has left it sporadically, telephonically bilious. Anyway. Lots of practising for the weekend's two Malt and Barley Revue gigs in Glenfarg and Lathones (near St Andrews). And some cycling. 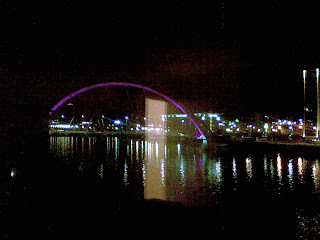 That's the view from the flat, by the way - six months to fix the 'Glasgow Arc' better known as the Squinty Bridge, with taxi drivers (who know all) blaming the use of Chinese steel. 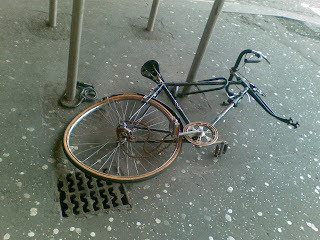 The bike isn't mine - it's been locked up and broken at the corner of Buchanan Street and Bath Street for years. How many other lost and busted bicycles are there in our cities, locked up and forgotten, or just abandoned, by owners who may be on the other side of the world, or dead? Martha's Scottish National Children's Orchestra gig at the Royal Concert Hall was splendid, with the National Youth Jazz Orchestra performing as well...but why do Scottish jazzateers insist on speaking half-American and adopting all the mannerisms of Miles Davises? Mmmmm....nice! And why, as Peter Capaldi memorably said in today's Guardian, can't jazz players just leave those melodies alone? "No-one loves a seagull". So said Doug Johnstone the other day on the Radio Cafe, describing a scene in his latest, excellent book, The Ossians. The scene in question is set on the North Pier of Aberdeen. 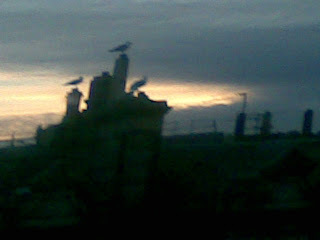 Here are three that escaped. The other two pictures show two churches, immediately opposite one another. 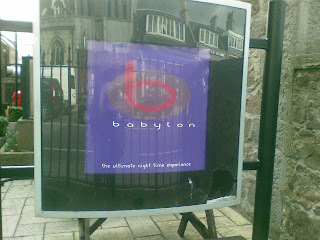 One, like many disused kirks in Aberdeen, has been converted into a club and bar called, well Babylon. 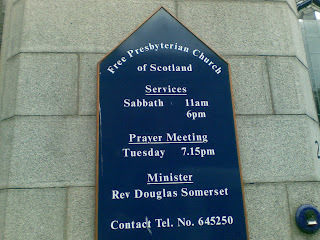 The other houses a Free Presbyterian congregation. It seems rather...Aberdonian. Last week on the show I asked listeners to send in their synonyms for 'being drunk'. The idea was to turn the various terms into a poem which will feature in the Malt and Barley Revue (premieres on April 12th and 13th at the Glenfarg Hotel and the Inn at Lathones). So, here we have rather more than 26 words for pishedness...thanks to all concerned. 'Full of loudmouth soup' is the best one, I think.